The Ambrax Swallowtail (Papilio ambrax) is a large and handsome butterfly that occurs in rainforest of the Wet Tropics and the Mackay district of mid-east Queensland. Although it is not common on this patch, this species turns up regularly in the late wet to early dry. This female is about the size of a small bird. She fluttered around for a long time, keeping between one and three metres off the ground, pausing briefly to check out the plants for suitable ovipositing sites. Nothing seemed to take her fancy. I mistook her at first for the more widespread Orchard Swallowtail (P. aegeus), beautiful bane of citrus growers along the east coast. But female P. aegeus have blue spots on both the upper and low surfaces of the hind wings. These are absent in P. ambrax. 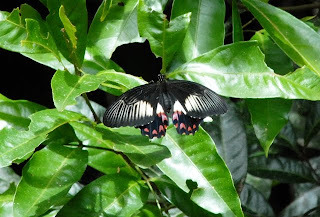 The Ambrax Swallowtail is also tied strongly to rainforest, whereas the Orchard Swallowtail is more catholic in its habitat. 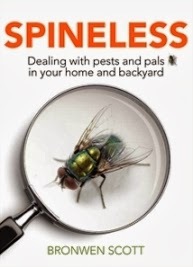 It has almost certainly extended its range thanks to the (inadvertent) kindness of gardeners. Boy she is beautiful! I have a distinct lack of butterflies this year. Same here, meggs. I think the very wet Wet Season might have interrupted the cycle. Ooh, she is just lovely. I don't think I've spotted one of these yet, but then I haven't really taken all that much notice of the butterflies here until last year. Thank you for the ID on the bee in my MM post. After googling, I think you might be right. Worth looking out for, but they might be on the edge of their range in your area, Bernie.